September is coming to close, and boy is this year going fast! While doing some tidying up and throwing out a decent amount of makeup, I gathered up my empties for the month for my first Empties post. Up & Up Smoothing Shaving Gel + Soy- a dupe for the Aveeno one, this is an okay shaving foam, but I can't say I'm particularly in love with it. I've moved on to trying Cremo, which I'm finding I prefer better since shaving foams just make my skin feel dry. I probably won't buy this again, but if you do like shaving foams, it's not a bad one. I can't say it actually did much to help my make leg hair finer, personally. Clinique Mild Clarifying Lotion- A "Caroline Hirons Made Me Buy It" product, this is an alcohol-free, salicylic acid based toning lotion. Apparently they've changed the formulation since, but I found this to be useful in the AM, or on days where I felt I needed a break from glycolic acid. I would probably read up more on the new formula before repurchasing, however. Bourjois Healthy Mix Foundation- My holy grail! I love this foundation so much and just bought another one earlier in the month while in London. It's got great coverage, doesn't look cakey, doesn't dry our my skin or accentuate my pores, and I just really, really, super love it. Neutrogena Rapid Wrinkle Repair Serum- I've been using this as my PM retinoid treatment, which for $20-25 depending on where you shop isn't a bad price, and it does seem to do something to help keep skin texture more even, I'm finding. Not totally super sure on the wrinkles part yes as I only have very faint ones around my eyes (pro-tip: don't tug and drag your concealer and forget sunglasses, it adds up when you get older), but they aren't getting worse either so maybe it's helping? As repurchasing goes, I'm trying out the CVS brand dupe for this right now, which seems to have the same effect for a few bucks less. Nivea In-Shower Body Lotion Nourishing- There's a few different variants of this, and I had grabbed the almond oil over the shea butter one. This is basically like conditioner for your body, you put it on in the shower and then rinse it off. The skin on my arms and legs gets pretty dry since I live in a dry climate, and this has been super helpful in combatting this. It also helps in being quicker to apply than me faffing around with body lotion and waiting for it dry. You do need to be a little careful rinsing it off as it's an oil and be a little slippery on shower floor/tub, but other than that it's a brilliant product I would buy again. Origins Dr. Weil Mega Mushroom Skin Relief Mask- I honestly can't say that did this anything for me. My skin isn't too crazy or too red, so maybe I was the wrong audience for it, but I probably wouldn't buy this again. Garnier Clean+ Makeup Removing Lotion Cleanser- This is a good cleansing lotion if you have very dry skin or in the winter months. I consider this more of a makeup remover than straight-up cleanser to be honest, but it does remove makeup well as a first cleansing step. Personally I prefer oils or cleansing balms, so I probably wouldn't buy this again but I would recommend it for dry skinned folks looking for a creamy makeup remover. Pixi Glow Tonic To Go- I've been waiting for them to come out with this! I love Glow Tonic, and having a portable pad version seems like a no brainer. This is a good 5% glycolic acid formula in an aloe vera and ginseng base that has no alcohol and is one of my favorite acid toners on the market currently. I definitely think it's helped with the appearance of my skin, and I do repurchase every time I run out, in conjuncture with the Nip+Fab Glycolic pads. Garnier Skin Active Clearly Brighter Dark Spot Corrector- AKA, how I get my Vitamin C fix on the cheap. I do really like this product, using it as sort a substitute Vitamin C serum in the AM. When I do get pimples, they sometimes, annoyingly, leave marks for a good while and I like to think this, amongst the other skin brightening/retexturing products I use, helps. I will be buying more once I get through the La Roche Posay Effaclar C I bought, which for some reason I find balls up so annoyingly on my skin. 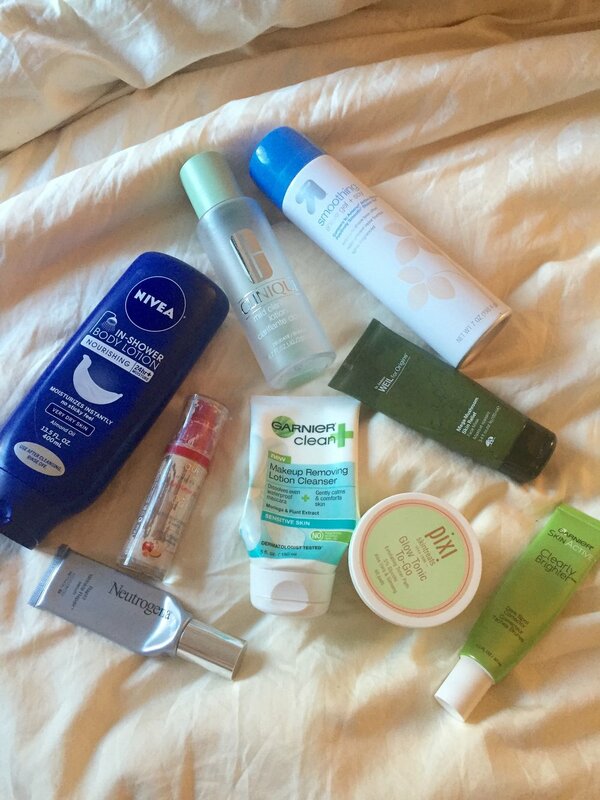 What are your empties this month? Any faves or fails?